People have been left baffled after photos of an eel fish being surgically removed from a man's body surfaced online. 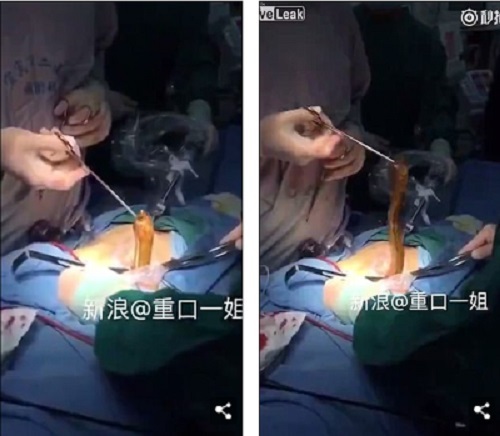 Shocked doctors have successfully removed an eel (elongated fish) surgically from a patient's body, after it was allegedly inserted for sexual gratification. 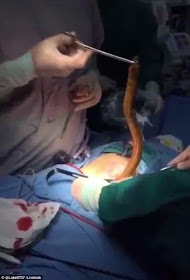 In a video footage posted online, a surgeon delicately holds onto the end of an eel with surgical forceps. The surgeon then slowly begins to lift the eel out of the unconscious patient on the operating table. It's unknown how the eel ended up inside the person, however the video description suggests it was for sexual gratification. People have been left baffled how a man could have lived with such a thing in his body.